Here is a recap of Wildcard Weekend of the 2016 NFL Playoffs with a Monday Afternoon QB & thanks again to AP Sports/ Pro 32 for photos & articles. KANSAS CITY, Mo. (AP) — Marcus Mariota did everything he could to help the Titans advance in the playoffs, throwing a crazy touchdown pass to himself , running for crucial first downs and providing the kind of spark that Tennessee needed to rally from a 21-3 halftime hole. It all added up to a heart-stopping 22-21 victory over the Kansas City Chiefs on Saturday, the first postseason win for the Titans in 14 years and one that will provide some relief — for the week, at least — for embattled coach Mike Mularkey and his remarkable bunch of underdogs. 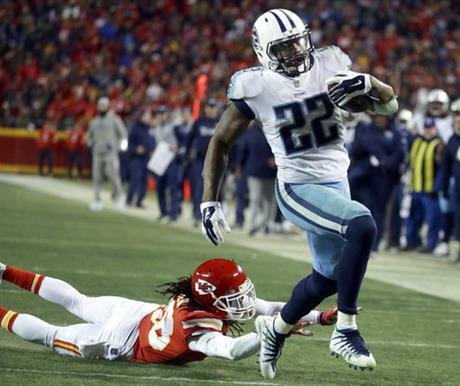 Derrick Henry added a career-high 156 yards rushing and another score for Tennessee (10-7), while a defense fileted by Alex Smith and the Chiefs (10-7) in the first half pitched a shutout in the second half — dooming the Kansas City franchise to another humiliating postseason defeat. “I’m in shock,” Smith said. “The swing at halftime to the final whistle, definitely a shock. Yeah. Didn’t feel like we played up to how we’re capable of playing and that’s disappointing. Kareem Hunt, the league’s top rusher this season , plunged in from 1 yard for a 7-0 lead. Smith hit Travis Kelce, who later left with a concussion, with a 13-yard touchdown pass. And he added another TD toss to Demarcus Robinson on the final offensive play for a 21-3 lead at the break. But it was the Titans who finished, and it was Mariota who led the way. He capped a 91-yard TD drive to start the second half in the bizarre fashions: Mariota threw a TD pass to himself. His throw to the end zone was batted right back at him by Darrelle Revis, and Mariota hauled it in and dived for the goal line. It was the first time a player has thrown a TD pass to himself in the playoffs, and the first time in any game since the Vikings’ Brad Johnson during the 1997 season. “Right place, right time,” Mariota said with a smile. Tennessee nearly squandered its momentum when Adoree Jackson fumbled a punt, but the Chiefs were unable to pick up a first down and Butker knocked a 48-yard field goal off the upright. And the Titans capitalized when Henry rumbled nearly untouched 35 yards for a touchdown a few minutes later. The Chiefs’ offense had been rendered impotent by that point, unable to move the ball after Kelce left with a concussion in the first half. And the Titans blanketed Tyreek Hill whenever he touched the ball, and they stacked the box to slow Hunt down in obvious rushing situations. Finally, the Titans pulled ahead on Mariota’s strike to Decker, and that led to more controversy from the officials. Tennessee went for a 2-point conversion and a field-goal edge, Mariota fumbled as he was getting sacked and Frank Zombo scooped up the ball for two points the other way. But the officials had blown the play dead, ruling Mariota’s progress had been stopped, and the Titans retained the slimmest of margins — one that would stand up to the final whistle. The Chiefs also complained about the officials blowing their whistles on a play late in the first half, when Mariota fumbled while getting sacked. He clearly lost the ball and the Chiefs picked it up, but the play could not be reviewed. Tennessee wound up kicking a field goal. Only two other road teams have rallied from at least 18 down to win a playoff game in NFL history. The Cowboys came back from 21-3 in the first half to beat the 49ers 30-28 in December 1972, and the Lions came back from 27-7 in the second half to beat the 49ers in December 1957. Kelce sustained his concussion on a wicked blow from Titans S Johnathan Cyprien late in the first half. Kelce, who had four catches for 66 yards, lay stunned on the turf for a moment before wobbling to his feet. Trainers quickly took him to the locker room and he did not return. The Titans’ opponent in the divisional round will be decided Sunday. If the Jaguars beat the Bills in their wild-card matchup, Tennessee heads to New England to face the No. 1 seed. If Buffalo wins, the Titans head to face No. 2 seed Pittsburgh. 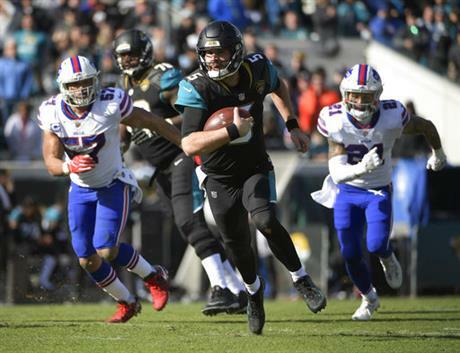 JACKSONVILLE, Fla. (AP) — Blake Bortles never had a game like this. Bortles became the second starting quarterback in the past 25 years to win a playoff game with more rushing yards (88) than passing (87). Atlanta’s Michael Vick also did it against the St. Louis Rams in the 2004 playoffs. “That’s usually not ideal for a quarterback,” Bortles said. “We had bigger goals,” Buffalo linebacker Preston Brown said. “Once we got in the dance, we didn’t want to be one and done. We didn’t want to treat this like a bowl game, go down to Florida and everybody relaxes. We wanted to move on. Bortles was a big reason Jacksonville won its first playoff game since January 2008. He was big reason it was so close, too. Taylor’s helmet slammed hard against the ground after getting thrown down by Dante Fowler Jr. He had to be helped off the field, forcing backup Nathan Peterman into the game with 1:27 remaining. All-Pro cornerback Jalen Ramsey tipped and then intercepted Peterman’s third pass, and the Jaguars ran out the clock. The Bills finished with 263 yards, 119 of those coming from hobbled running back LeSean McCoy (ankle). The Jags had a measly 230 yards, the team’s third-fewest total of the season. Leonard Fournette ran 21 times for 57 yards. Trailing 10-3 with about six minutes to play, the Bills looked as if they picked up a first down on an 11-yard pass from Tyrod Taylor to Clay. Jacksonville players standing on the sideline pointed to Clay’s feet, and coach Doug Marrone threw the challenge flag. Officials overturned the completion, saying Clay was out of bounds and setting up a third-and-10 play from the Jacksonville 48-yard line. Linebacker Myles Jack sacked Taylor on the next play, forcing a punt. Bills: Safety Micah Hyde left the game in the third quarter and was being evaluated for a concussion. Cornerback Tre’Davious White went to the locker room in the fourth to be treated for cramps. Safety Colt Anderson injured his right shoulder in the fourth trying to make a diving interception. “I’m sure they’re thinking that game was a fluke,” Ramsey said. Devonta Freeman rushed for an early score and Matt Bryant kicked four field goals for the Falcons (11-6), who spoiled the Rams’ first playoff game in 13 years with a methodical performance derived from hard-earned experience. Atlanta’s journey to the Super Bowl last season ended infamously with that blown 28-3 lead against New England. In their first playoff game since, the Falcons allowed no surprises from the NFC West champion Rams (11-6). Jones caught nine passes for 94 yards for Atlanta, which never trailed while winning playoff games in consecutive seasons for the first time in franchise history. Against an opponent that had just six players on its roster with prior postseason appearances, the Falcons’ experience showed through. The Falcons jumped to their early lead by capitalizing on two mistakes by Pharoh Cooper, the Rams’ Pro Bowl kick returner. Atlanta’s offense then chewed up the clock and field position, with the first drive after halftime consuming 8:15. The Rams’ offense finally figured it out late in the first half: Goff made several sharp throws on a 79-yard drive ending in Kupp’s TD catch, and Sam Ficken’s first field goal trimmed the halftime deficit to 13-10. 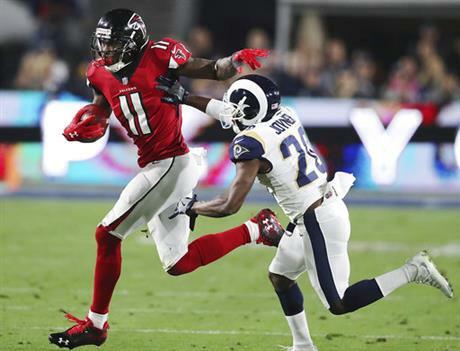 But the Rams’ defense simply couldn’t get off the field in the third quarter, whether due to missed tackles or clever play-calling by the Falcons. “Great call by Sark,” Ryan said. A bottle with the name “Jordan” on the label — even if it isn’t made by the Saints star’s family — might be the last thing Newton wants right now. Drew Brees and his receiving corps came through when Carolina stifled New Orleans’ prolific backfield, and a relentless Jordan spearheaded a late defensive stand to seal a 31-26 NFC wild-card round victory on Sunday. “I’m frustrated,” Newton said. “I hate that I couldn’t do enough to get a win today for a lot of guys that I think so highly of. Helped by the presence of tight end Greg Olsen — who did not play in the teams’ previous two meetings — Newton marched Carolina into Saints territory more often than not. 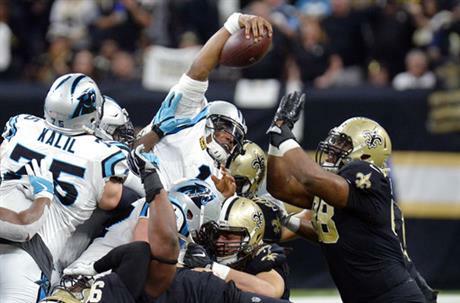 But the Panthers stalled four times inside the New Orleans 25 in the first three quarters. They settled for four field goal attempts on those drives, one of which kicker Graham Gano surprisingly missed from 25-yards. “Had half of those been touchdowns, we’d be sitting in a different spot,” Jordan said.